Forget those poetic magnets with words that cover an entire refrigerator. Not that they aren’t fun, but I’ve found something better. This afternoon, I was visiting a friend’s gift shop and I ran across something full of geeky fun. It was a magnet set based on the old Pac-Man game. 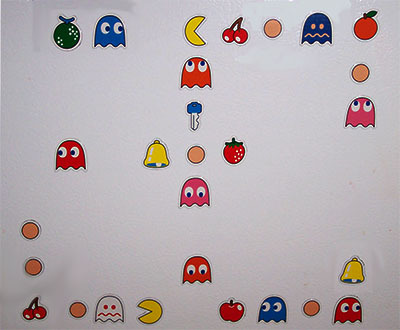 There is a mix of characters: 2 of Pac-Man, a number of ghosts in both normal and eatable status, fruit (as well as bells and a key), and pellets. It’s great all the combinations you can make though I wish there were more pellets for making paths. Here is my first layout.